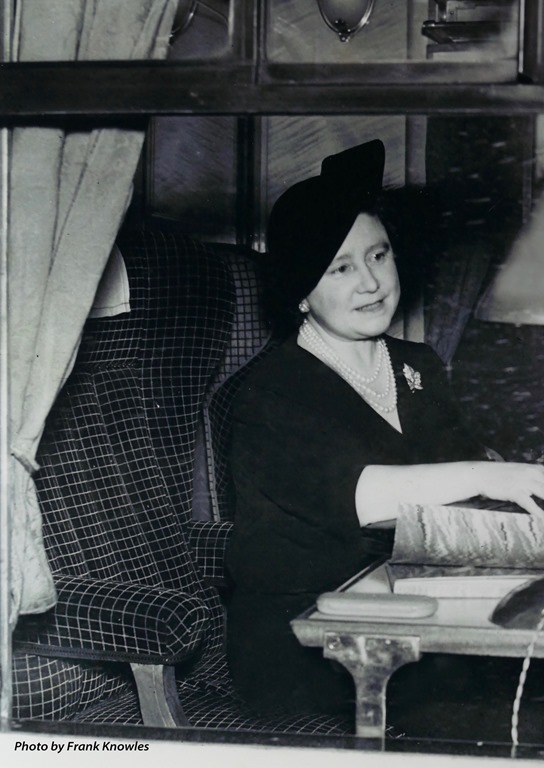 He was working for the Ackrill Group of newspapers based in Harrogate and had gone there to process the glass slides which were then used as negatives. He was asked to go to the station and try and get a photo of the Queen Mother. “Everything was cordoned off. There wasn’t a soul on the platform but I got on alright. It was a long train and I had to go right down the platform. Eventually I found the Queen Mother. She was sat at the window, had her glasses on, her ledger open and was writing in it. 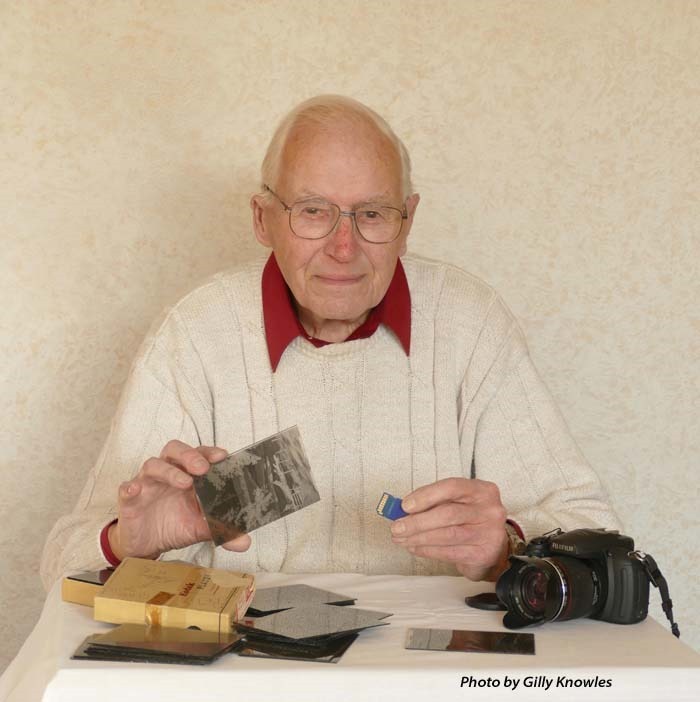 Frank was 15 when he left Harrogate Grammar School and joined the Ministry of Aircraft Photographic Laboratory in Harrogate in 1943. His job entailed making 8×6 inch contact prints from whole plate glass negatives. He explained: “Many of these were photographs of new and secret aeroplanes and were subject to Official Secrets Regulations. “When the Ministry of Aircraft moved back to London I started as a printer with the Ackrill Group.” He did his two years National Service in the Army during when he continued his interest in photography. He even took the official photos of his Company Commander, Officers and NCOs for recording purposes. Those provide a remarkable glimpse into the life and times of the dale which became his home. They include house fires, train crashes, local gymkhanas and dramatic winter weather. “Perhaps the most memorable and scary event was being with a bomb disposal team on the moors and actually touching a live 100lb German bomb prior to it being detonated,” he commented. The bomb disposal unit from Portsmouth had been sent to Wether Fell near Hawes in 1957 to deal with the bomb. The unit took five weeks to reach it but Frank had only a fraction of a second to photograph the 200ft-high plume of debris when it exploded. It was even harder for him to estimate the right moment to take a photograph when one of the largest prepared explosions in England took place in Redmire Quarry in 1952. His photograph showed the rock face bulging outwards due to the impact of the 3,750lbs of explosives when they were detonated inside a tunnel. “I had to follow a lot of ambulances to get one good story,” he told me. One ambulance took him to the Blea Moor tunnel near Ribblehead station where, in April 1952, the morning express from Glasgow to London had crashed. He was the first pressman at the scene and took some moving photographs of not only the crash, complete with discarded pram, but also of a mother and her baby waiting with other slightly injured passengers for transport. Frank didn’t chase fire engines. Instead he often beat Leyburn’s retained firemen to a fire. One day only two turned up at the fire station, a fireman and himself! They loaded a couple of extinguishers into his press van and went to a house in Leyburn where a settee was smouldering. “The fireman and I carried it out into the garden and he put the fire out.” Not surprisingly Frank has no photographs of that fire scene. But he did get others such as in Bedale when a car burst into flames behind Mr Brears’ ironmongery shop. The man who had been working on the car was in flames as he ran for help. Frank arrived in time to photograph people using new buckets from the ironmongery as they helped quench the flames. “I was also involved in life and death situations,” he said. “On one occasion I helped a farmer to deliver a calf with a difficult birth. I pulled on a rope around the calf’s legs. Another time I took some photos of a fire where an old gentleman died. The photos were used by the police at the inquest – obviously they were not published. Photographing gymkhanas was a particularly difficult job. He had to decide, before a horse jumped a fence, if the rider was likely to come a cropper or not. If he aimed at photographing the final part of the jump it was possible he wouldn’t get an interesting photo at all. He did capture the moment at Bellerby one year when a competitor’s horse “carried all before him” and destroyed a jump. In addition to carrying the large camera and a box of glass slides he also had to take a heavy pack to recharge his flash unit.“It was terrible when you were going off to take snow pictures. You had this great weight on your shoulder,” he said. He was always expected to cover bad weather stories, however dangerous. In December 1952 he heard about a multiple pile-up outside Leyburn. As he reached the scene his own van skidded on the black ice and was damaged. “It was happening so fast no one could run up the hill to warn people. You had to keep leaping out of the way. It was like one of those funny films,” he said. In all 11 vehicles were involved including two large Army trucks and the seven-ton army recovery lorry sent to rescue them. 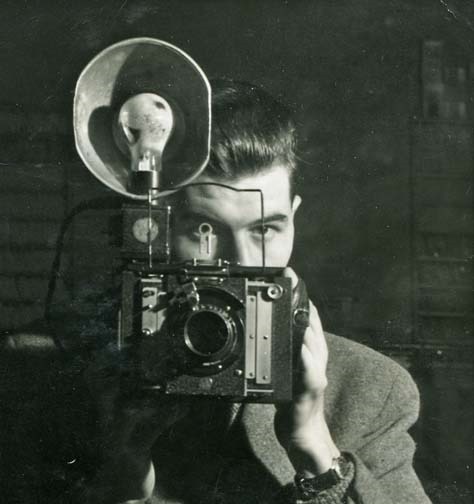 Above: Frank and his camera in the 1950s. In February 1956 he joined a post woman, Marion Bowes, from Ulshaw Bridge, to photograph her trying to deliver letters during a four-day snow storm. Together they battled their way up to Sowden Beck farm where they found Mr and Mrs Banks feeding their sheep. Marion had just one letter to deliver and when Mrs Banks opened it she commented: “You needn’t have brought that.” It was a notice of a rent increase! In 1953 he married Betty Wray whose father and uncle ran the ironmongery business in the centre of Leyburn. He joined the family business in 1960 and continued to manage it, even after it was taken over by new owners, until he retired in 2004. He will be 90-years-old on January 31 but is as determined as ever to continue taking good photographs. He uses what he describes as a glorified digital camera which has a zoom lens but no interchangeable lenses. “It’s a lot lighter,” he said with a chuckle. Above: Frank pointing out the difference between the glass slides he used in the 1950s and, on the right, a modern SD card on which over a thousand photos can be stored. Photo by Gilly Knowles. He also showed me his excellent action photo of cyclists racing towards Leyburn during the Tour de France in 2014. “Even today it depends on what the photographer wants and how he is going to get it,” he commented. Both he and his daughter, Gilly, took pairs of steps with them so that they could be above the crowd to take photos of the Tour de France. Photography has become a family tradition for the Knowles. Frank explained: “One hundred years ago my mother was employed as a photographic finisher at Davey’s, a well-known Harrogate photographer in James Street. Gilly added that, as a family, they produce a calendar every year. The photographs for these are contributed not just by Frank, Gilly and Andrew but also by Ben and Abi. It was Gilly who introduced Frank to Leyburn Band when it was re-started in 2003. She plays 2nd horn – while Frank takes the photographs. “I must have two to three hundred pictures of the band,” Frank said. One of the regular venues has been Tennants Garden Rooms. He described how Rodney Tennant (chairman of Tennants Auctioneers) had allowed him to photograph the band from anywhere he wanted. And it was Rodney who encouraged Frank to hold an exhibition there of his 1950’s press photos. The curator at the Garden Rooms, Harriet Hunter Smart, worked with Frank to organise it. Together they chose 60 out of the 200 that he and Gilly have made digital copies of. One of those photos is of a crowd at Middleham and in the front is Rodney in school uniform. Harriet was keen to have photos for which there were stories. “It was quite a job writing full captions,” commented Frank. The exhibition includes the photo he couldn’t take – that of his own wedding. “I must have taken over 1,000 wedding photos over that ten years,” said Frank. Some people still remind him that he took their wedding photo. Gilly is looking forward to hearing peoples’ comments at the exhibition. Those who took the opportunity to visit on January 18 so as to meet Frank were very impressed.